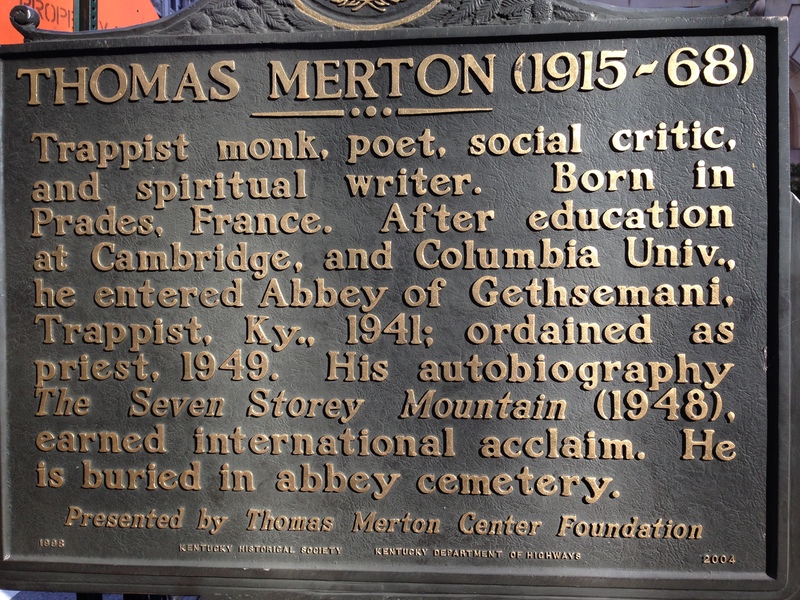 Thomas Merton (1915-1968) was a writer and Trappist monk at Our Lady of Gethsemani Abbey in Kentucky, not too far from Louisville. His writings include such classics as The Seven Storey Mountain, New Seeds of Contemplation, and Zen and the Birds of Appetite. Merton is the author of more than seventy books that include poetry, personal journals, collections of letters, social criticism, and writings on peace, justice, and ecumenism. When I first encountered Merton I had no earthly idea how to understand him or to make sense of his voluminous writing. (It strikes me that I am still working on this project and will never finish it.) Initially, Merton struck me as a liberal Christian because he embraced views on certain political and social views that were not conservative as such. Further more, I had no comprehension of how to make sense of his mysticism. Merton said, “The theology of love must seek to deal realistically with the evil and injustice in the world, and not merely to compromise with sin.” That sums up his overall perspective well. If I can unite in myself the thought and devotion of Eastern and Western Christendom, the Greek and the Latin fathers, the Russian with the Spanish mystics, I can prepare in myself the reunion of divided Christians. . . . If we want to bring together what is divided, we can not do so by imposing one division upon the other. If we do this, the union is not Christian. It is political and doomed to further conflict. We must contain all the divided worlds in ourselves and transcend them in Christ. I was in Louisville last October and took a Thursday afternoon stroll down a historic street. I stopped to read one of the markers about local events and people. The place where I stood led me to read about an encounter with God that Merton had on this spot and the sign was a historic tribute to Merton. I couldn’t resist taking a photograph of this marker. 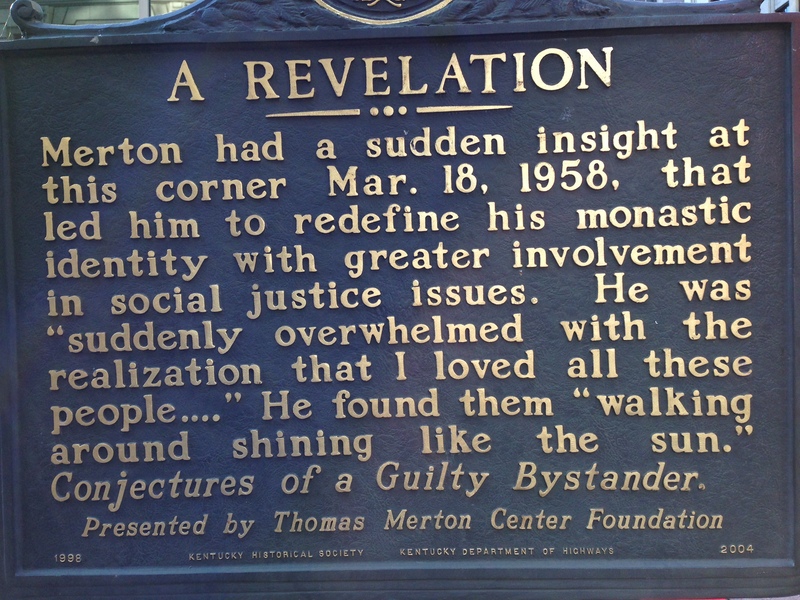 Merton’s commitment to social justice was clearly rooted in an encounter with divine love. The second plaque is wonderful. Fills my heart with joy. Recently I’ve felt something similar meeting people at a food bank. Thomas Merton was a great influence on me in the mid to late 1980’s and then I did not read him much again until the last two years. Really appreciate his writings. He and Henri Nouwen have been wonderful to read and contemplate on, for their rich thought provoking insights. Adam Ross liked this on Facebook.